Madge asking Harold if they are still going to Paris. Susan being suspended from school. Tad is telling Paul how his interview went. He sees Susan leaves and tries to speak to her but she ignores him. Susan is moaning to Karl how she let the Jess situation get to her. A knock on the door interrupts them, its Susan's nephew Darcy wanting a shoulder to cry on. Harold is praying when Kate comes over and tells him they've been praying for Madge. He tells her Madge wants to go to Paris and they both pray for that to happen. Tad is moaning to Paul what Jess is getting out of this situation but Paul is thinking that everything in the shop reminds him of Madge. They start to reminisce. 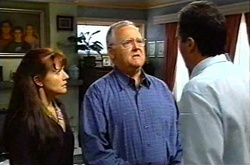 Darcy tells Karl and Susan that he and Alice are having a trial separation. Karl and Susan are upset for him and say he can stay with them. Harold is talking to the consultant. He tells Harold that Madge has septicaemia and the cancer has advanced, so she can't go to Paris. Madge is putting a brave face on the news that the trip is off. Dee comes in to say bon voyage but they tell her the trip is off. When Dee leaves Madge asks Harold to take her home. Susan is talking to Darcy about her suspension. 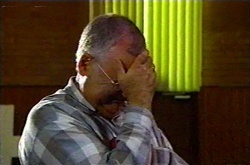 Karl comes off the phone from Madge's consultant when Harold comes in relaying Madge's request. Karl says to let her enjoy the time she has got left. An ambulance brings Madge home and Tad and Paul to out to meet her. Tad welcomes her home but Paul stays tight-lipped. Tad has a go at him but Paul explains he didn't know what to say. Tad tells him then to be cheerful but Paul says how can he when Madge has come home to die. Madge is glad to be home and Karl is giving her a quick check over and says to call him anytime if there is any problems. When Karl leaves Madge asks them why are they are so gloomy while she is still there but Paul quickly leaves the bedroom. Mal has just phoned to tell his parents he is getting married. They are both over the moon at the news and celebrate with Darcy. Darcy suggests he covers for Karl whilst they go to the wedding. Madge wonders why Harold is quiet, he's saying a prayer and Madge wishes she had his faith. 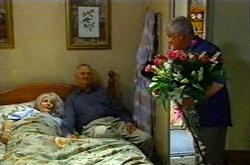 Lou calls round with some flowers to cheer Madge up and give her the latest gossip. Paul and Tad are outside whilst Harold is inside praying but he breaks down crying. When he comes out he says he'll drop them off at school. Neither wants to go to school but he orders Paul and Tad to go because life goes on as normal. 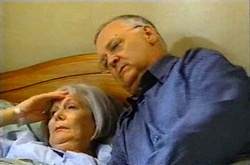 Paul is concerned that Madge will die and they don't get to see her and Harold suggests that God may answer his prayers and give them more time. Steph is telling Tess about Woody being released from prison soon, and she has offered to let him stay at No. 26, even though she hasn't asked her parents. They change the topic of conversation to the auction of No. 32 when Dee comes in. She tells them Madge isn't too good and that Darcy is back in town. 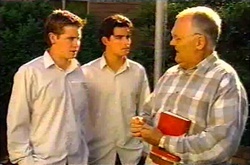 Susan is removing her personal effects from the school when she comes across Tad and Paul in the playground. She is surprised to see them and they say Harold wanted them to go even through they didn't want to. 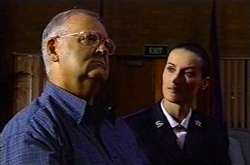 Tad talks to her about the inquiry and that he is on her side and he'll talk to Jess. Susan thanks him and tells him to concentrate on Madge. Karl is adjusting Madge's pain relief and says he will come back later. 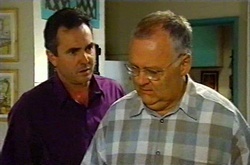 Harold and Karl go into the kitchen and Harold asks if there is any chance that Madge might recover. Karl says there is nothing he can do and that he should prepare to say goodbye as she can go any time. Harold wants some more time but Karl tells him to use his faith to get through it. Harold tells him he hasn't got any faith left for what God is doing to Madge.